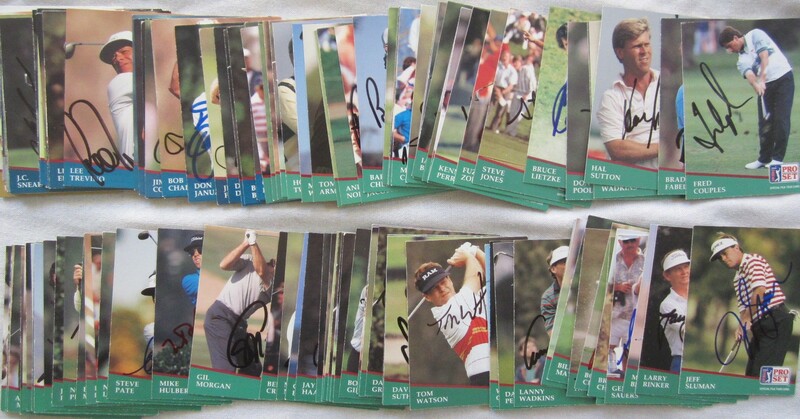 Partial set of 122 different autographed 1991 Pro Set golf cards (various pens) including 39 cards signed by major winners: Jeff Sluman, Mark Brooks, Larry Nelson, Lanny Wadkins, Wayne Grady, Tom Watson, David Graham, Larry Mize, Ben Crenshaw, Paul Azinger (very minor smearing), Nick Price, Jerry Pate, Hubert Green, Davis Love III, Don January, Lee Janzen, Mark O'Meara, Scott Simpson, Bob Tway, Fred Couples, Hal Sutton, Steve Jones, Fuzzy Zoeller, Steve Elkington, Ian Baker-Finch, Mark Calcavecchia, Ray Floyd, Andy North, Craig Stadler, Gary Player, Gene Littler, Bob Charles, Lee Trevino (regular and Player of the Year card), Gay Brewer (deceased), Al Geiberger, Charles Coody, George Archer Stat Leader card (deceased) and Orville Moody (deceased). All autographs obtained in person at various PGA Tour and Champions Tour events, with certificate of authenticity from AutographsForSale.com. Tom Shaw personalized his signature To Allison. Cards average NrMt to NrMt-Mt condition. ONLY ONE PARTIAL SET AVAILABLE FOR SALE.